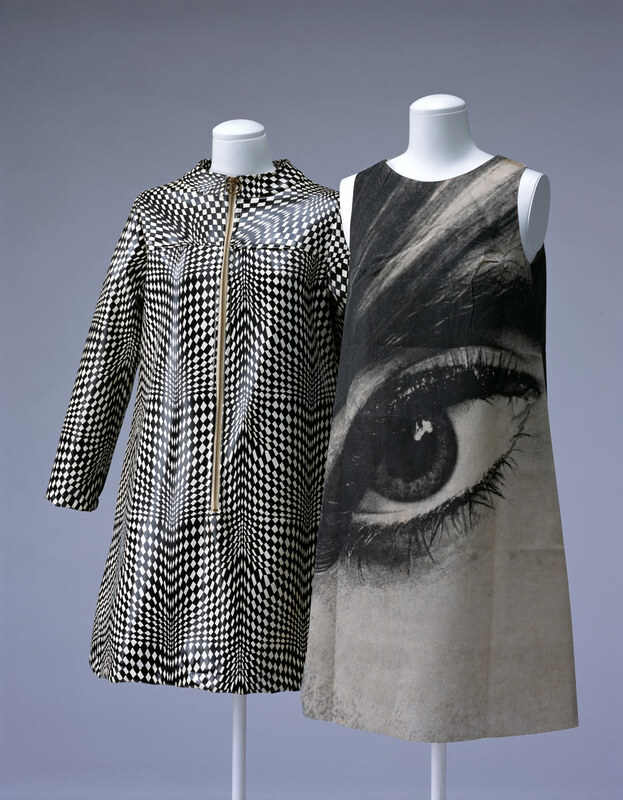 These two ready-to-wear dresses define the relationship between art and fashion in the 1960s. During the 1960s, with the new mass consumption society in full swing, public attention was seized by the fine arts, including Pop Art, which was based on everyday objects in the mass consumption society and led by Andy Warhol (1928–1987), and Op (optical) Art, which studied and applied optical illusions, with Victor Vasarely (1906–1997) and Bridget Riley (1931–) taking principal roles. In Haute Couture, Yves Saint-Laurent (1936–2008) was among the first to apply those new art styles to fashion design. When reasonably-priced ready-to-wear dresses created a special furor in the just-started prêt-a-porter age, the arts spread in prêt-a-porter as well. Art and fashion were linked again via a new agent, the public, and it looks at the powerful links between the two disciplines since then.